Spears makes the highest quality True Union check valves. Use them to add a last line of defense against overflows. Check valves allow one directional water flow and are used to prevent back siphoning. They are commonly used on return pump outputs to prevent water overflowing the sump in the event of a power outage, pump failure or maintenance. These check valves feature true union fittings on each end for easy replacement and disassembly. The golden rule of plumbing is that every job takes three trips to the store. While this can be frustrating locally it can be much much worse when shopping online. Being short a fitting or two can delay a plumbing project for days. Here are some quick tips to avoid this. i don't hard plumb anything as i think a well thought out design can mean white silicone or black vinyl tubing and barbed fittings everywhere. i put barbed fittings on this thing and have it hanging free. i probably lost a little bit of head pressure, but it works flawlessly after a few months, and it makes sump maintenance easy when i'm not fighting a full tank. its easy to dissassemle and clean the inside with a toothbrush or even small fingers. the wye check valve had a lot of reviews of thumping and that pushed me to this one. it has less moving parts and its pretty straight forward. Acts as a union and perfectly as a check valve. I have three of these now and love them all. My oldest is 3 years old and with basic cleaning once a year it hasn't shown any signs of failing. The true union is a significantly better choice over the other non true union option since it allows for easy disconnection of the valve for cleaning. I have been using these for about 10 years. After some time, coriline will prevent it from totally closeing, and will need to be replaced. Soaking in vinagar helps to extend the life. My return from sump to display tank is 3/4" clear tubing. Would this product be best to prevent back siphoning? This product would work just fine for that purpose. 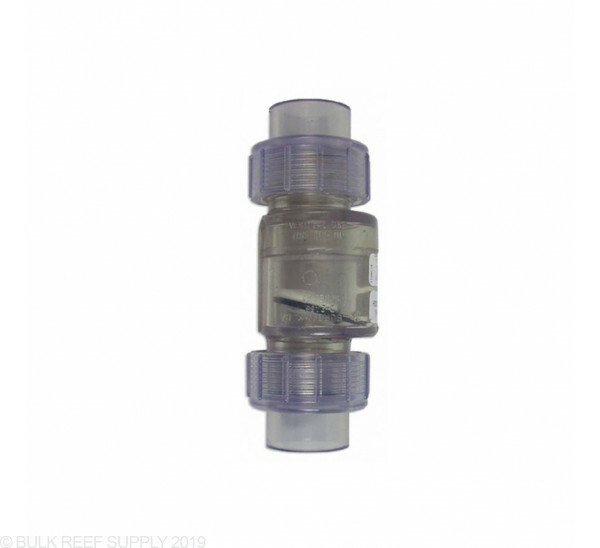 Just keep in mind that the fittings on this valve are slip fittings (for PVC pipe) so you will want to glue in a pair of barb adapters like the ones linked below so that you can use it with your flexible tubing. To piggyback on Richard's question. I'm using the braided vinyl for my return with the CPR return. I need to get a check valve in there as well. So with this valve would I be able to use PVC cement to attach it in my vinyl line? Or would I be able to use more ratcheting clamps? Just need to know how I can get a check valve in there safely. These check valves come ready for rigid pipe. In order to use flexible tubing you would need to first glue in a barb fitting, for example the street x barb fitting. From there you can put your braided tubing over the barb and secure with ratchet clamps. Can these valves be used at any angle or just vertical? Are the unions on this the same as any other union? For example if I were to lose or break the top screw portion of this could I substitute a union from the local hardware store's top portion and still have a good seal? We cannot guarantee these will work with other unions. If replacement are needed we recommend selecting the same brand. Feel free to let us know if you have any further questions! What is the length of this valve? The valves can be installed horizontally. You will want to make sure that the pivot of the flapper is at the top when it is installed though. Is it measured by the inner or outer diameter of the hose? Hi Anthony, thanks for reaching out! The sizes provided for the check valves denote what size PVC pipe or spigot (slip) fitting they will work with. Plumbing sizes are nominal and do not describe the actual measurement of the pipe or fitting. Are there any ways to buy only the union parts? I want to take one of these from my old tank and use it with my new tank, but I don't want to buy a brand new valve just because one of the union parts is now missing. We do not currently have just the replacement union parts available and a full replacement valve will be needed. Feel free to let us know if you have any further questions! Will this 1" fit on reg white 1" pvc ? Do you guys recommend placing these in the return lines routinely? How much will they decrease the flow back into the tank due to increased resistance in the return line? Thanks! The best thing to do would be to set your system up so there it is not a problem if there is no check valves (so you have enough room in the sump to handle the water). Then if you want to, you can add check valves for convenience if you like (you will have less issues like skimmer overflows if the sump doesn't fill with a bunch of water every-time the power goes out). They will have a bit of an effect on your flow but for the most part its not something you would notice with the naked eye. I know they come with fpt ,better yet offer both options like the cepex ball valve. I apologize for not having a threaded option for you. I have not seen the clear swing check valves with threaded unions but if our supplier has them I will suggest we carry them in the future. For now you can always add a pipe adapter to them to make them threaded. Does this check valve attach to pvc pipe or flexible tubing? If pvc are the connections threaded or smooth? 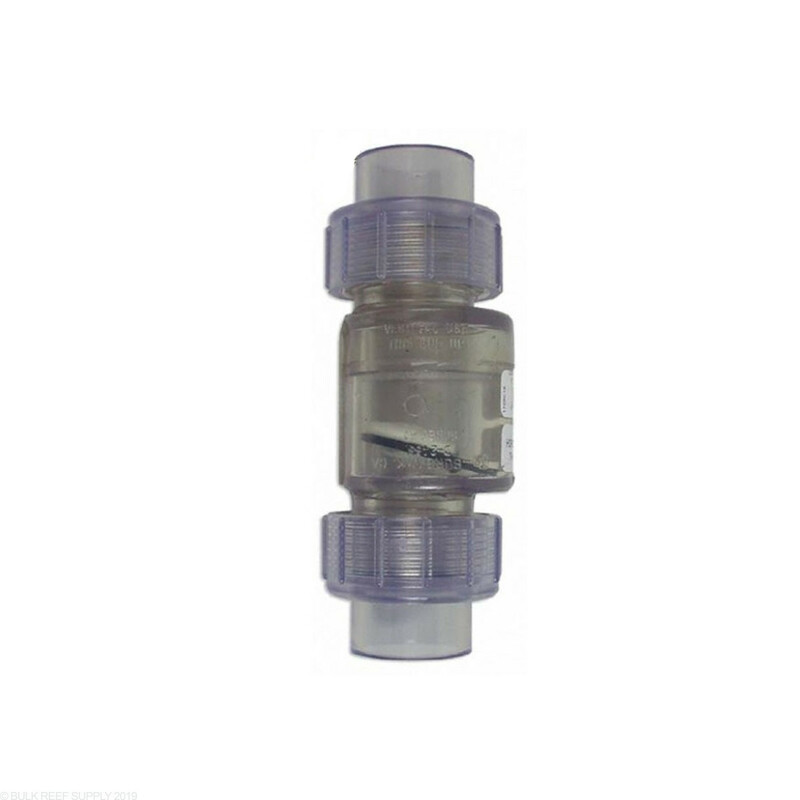 The check valve is a slip connection for pipe (which would be smooth).